This entry was posted in Aga, Books, lunch, pasta, supper, Uncategorized and tagged Aga, Aga cooking, Aga living, baked pasta, BBC, Books, Italian, pancetta, pappardelle, parmesan, pasta, pasta bake, porcini mushrooms, Simon Hopkinson, The Good Cook. Bookmark the permalink. This sounds delicious! It reminds of Martha Stewart back in the day with that milk and mushroom simmer then using the milk for the sauce. And thanks for continuing to post! I so appreciate it. I’m still learning to use my Aga. I think I’ve got it for the most part, but it is good to hear how others do things. Recently I’ve discovered a better way to do corn on the cob. Maybe you don’t eat corn that way where you are but here in Indiana it is a summer treat. So what I’ve discovered is just put the whole ear, outer leaves, silk and all into the roasting oven. Just chick it in!! Roast for about 20 minutes or so. Then take it out and peel back outer husk and the rest comes right off with it. No silk to pick off strand by strand! It works beautifully! And silly me, I was shucking the corn then wrapping it in foil to roast. No need! Anyway, thanks again for the great recipe!! Hope it starts cooling off for you there. Is a hot September here. I’m ready for the cool of Autumn!! How wonderful to have a reader from as far away as Indiana. 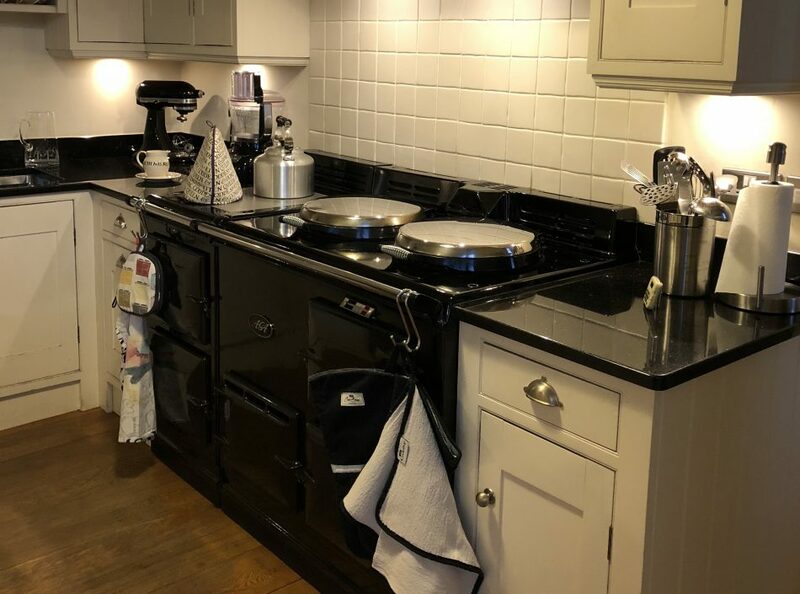 Thank you for reading; it’s great to know fellow Aga owners are getting something out of it. I must check out the Martha Stewart recipe and will definitely be trying your method for roasting corn. Thanks for that tip. It is much cooler here now; Autumn (I mean, Fall) is in the air. It looks delicious and I will definitely give it a go. I have Simon Hopkinson’s book ( somewhere) and I tried out his recipe for rice pudding. It was the best I have ever eaten. You know me as “oldbag47”. Hello “oldbag47”! He knows his stuff and writes excellent recipes. I remember years ago when readers of the Waitrose magazine voted for his “Roast Chicken and Other Stories” as their favourite cookbook.